In this HOWTO, we'll walk through installing FreeBSD 10.1-RELEASE as the sole operating system on a UEFI-enabled amd64/x86-64 PC to a single hard disk, with all except the /boot directory installed to a ZFS pool encrypted using geli(8). The /boot directory will reside on an unencrypted UFS partition. If you're reading this for a later version of FreeBSD then it will probably work, but there may be a better and easier way of achieving the same goal. FreeBSD 10.1 was the latest release at time of writing. It does not support UEFI Secure Boot. PC manufacturers' implementations of UEFI vary in quality. During the transition from legacy BIOS booting to UEFI, many manufacturers include a method of booting from both. This might be configurable or the firmware may decide which one to use based on the disk partitioning type (MBR or GPT) or presence of boot sector code. Even if your PC supports UEFI, implementation issues may prevent this method working for you. The configuration described here is not compatible with the ZFS Boot Environment management utilities sysutils/beadm or manageBE, since both of these make assumptions about the filesystem layout that aren't true here. If you're using an SSD, you should know that geli(8), which we are using here for encryption, doesn't yet support TRIM, which will unfortunately have implications for your write performance. This is not a HOWTO on different disk encryption techniques but you should understand what protection this configuration offers and what it doesn't. When designing security, it is important to keep in mind whom you are defending against. In this configuration, I'm aiming to prevent someone reading my data if I lose the computer (all too common for laptops) or if it is stolen by a thief more interested in selling the hardware for cash than for any secrets on the hard disk. I am not looking to protect my data from espionage level attacks or from covert modification. Encrypting information on a disk protects an attacker from accessing it "at rest", that is, when the computer is powered off. It offers no protection at all against attacks while the computer is powered on and you have made that information available in its decrypted (plain text) form. 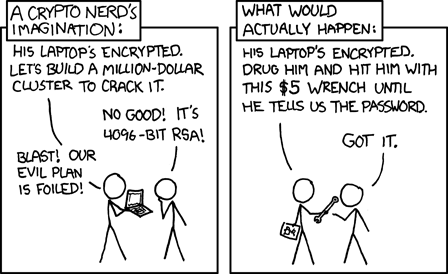 This is true for all disk encryption. The configuration described here has further shortcomings. Secure Boot is disabled, the kernel and its modules are available in unencrypted form on the disk and I will be using GELI without enabling data authentication. This means that if someone sneaky wants to plant attack software on the machine, conduct an "evil maid" style attack or even modify the encrypted data so it decrypts to something different, they can and you won't know about it. If I had different requirements, I would consider putting my UEFI boot files and kernel on a removable disk that I kept with me, enabling data integrity verification for my GELI partition, encrypting with AES 256-bit keys rather than 128-bit, physically securing my PC and making it tamper evident, locking down the firmware configuration, rewriting the UEFI bootloader to support Secure Boot, using a PC with a TPM chip, reviewing the FreeBSD source code, never connecting my computer to the Internet, installing an alarm system in my office, training an attack dog to guard my computer... you get the idea. You can hire me for security consultancy or attack dog training at competitive rates but for now, let's get on with the show. We're going to be overwriting whatever is currently on your hard disk so make sure that you have backed everything up! If this is one of your first few times installing FreeBSD, make sure you're familiar with the installation chapter in the Handbook and the preparation suggested there. We'll also need installation media from your nearest mirror. I suggest grabbing the UEFI memory stick image FreeBSD-10.1-RELEASE-amd64-uefi-memstick.img, since this will allow you to tell early on whether UEFI booting will work fine for you. Write the image to a memory stick (see section 2.3.1.1 in the Handbook). Check your PC or motherboard manufacturer for any UEFI firmware updates, which may include bug fixes. Disable Fast Boot (relating to Windows). Save your changes. As mentioned earlier, your manufacturer's UEFI implementation may not allow you to configure these. Plug the FreeBSD UEFI installation memory stick into your PC. When the PC powers up, you may need to press a key to choose a boot device (Esc, F9 and F12 are common possible options). Hopefully you will see a menu, which includes an entry for the memory stick, or perhaps just a generic "UEFI USB Drive". Select this to boot to the FreeBSD installation media. If you have booted successfully using UEFI, you should see a high resolution console with the first line "[FONT=Courier New]>> FreeBSD EFI boot block[/FONT]". Hit enter to boot immediately or wait for the counter to reach zero. After the initialisation process completes, you should land in the blue installation menu. Congratulations! Your PC should be fine with the FreeBSD UEFI loader. If your kernel panics on boot, then UEFI is not for you. If the FreeBSD USB stick wasn't listed in the boot options menu, try checking your firmware boot settings again. Just to confuse you (and possibly your PC's firmware), the installation memory stick is actually a hybrid that supports UEFI and legacy BIOS booting. If you are not able to explicitly disable legacy boot in your PC's firmware, it is possible that you have instead booted using legacy BIOS. If so, you will see the first line "[FONT=Courier New]BTX Loader[/FONT]" before arriving at the FreeBSD boot menu with ASCII art. Although this isn't a successful result, it does not mean all is lost. Our installation will be pure UEFI, not a hybrid so you may choose to carry on and hope that all comes good. At the welcome screen, choose Install and then choose your keymap, hostname and distribution sets as desired. When you reach the partitioning screen, choose "[FONT=Courier New]Shell Open a shell and partition by hand[/FONT]". Now, my young apprentice, the fun begins. Partition encrypted with geli(8) as a container for our ZFS pool. FreeBSD's FAT32 code appears to sometimes create filesystems that the UEFI code can't properly read. FAT16 worked fine and this is what we'll use here. We need the UFS partition since for FreeBSD 10.1-RELEASE, that is the only partition type supported by the UEFI loader. A sensible minimum size for this partition should allow enough space for the boot files and three copies of the kernel and modules (running kernel, newly installed kernel and a copy of the GENERIC kernel), which is about 1.5GB. We'll go for 10GB to give us more space than you can wave a stick at. As a rule of thumb, the swap partition should be about double the size of physical memory (RAM). Since this rule of thumb has existed from when 64MB was an enormous size of RAM, for modern systems that amount may be excessive. I've allowed 8GB swap here, which should be far more than you will ever need on a typical system. We'll also be aligning our partitions to 1MB boundaries, which is never the wrong thing to do. You could save a small amount of disk space by not bothering at all with alignment or instead aligning to 4K boundaries. It's relevant for performance on Advanced Format Drives, SSDs and RAID volumes but comprehensive discussion is off-topic for this HOWTO. You are free to disagree and do something different for any of this, but this is my HOWTO party and I'll cry if I want to... erm I mean design my partitioning how I want to. Please find somewhere other than this thread to argue. If your UEFI boot test failed earlier, now is good time to try to boot to the hard disk and see whether a pure UEFI boot (rather than a hybrid) is going to work. We haven't installed the kernel yet, so don't expect the boot loader to find one! We're going to configure our GELI container using the AES-XTS algorithm (recommended in the geli(8) man page, though AES-CBC would also be fine) with 128 bit key length for encryption and no(!) data integrity verification. If your processor implements AES-NI instructions, this will speed up encryption and decryption using AES-XTS or AES-CBC. Whilst data integrity verification is really very sensible, it means a performance hit as there is no hardware acceleration for the HMAC functions. 256 bit key length also means lower performance. With the caveats I offered earlier in this HOWTO, think about your security requirements, do some reading and decide what you want to do. Given this pragmatic (some may say cavalier) approach to disk encryption, you may be surprised that I'm going to use a key file in addition to a passphrase. Why, you ask? Why not? There are no performance implications and it helps to mitigate an attack using a rainbow table, where someone could compute in advance all the possible hashes of the passphrase; the key file is effectively salt here. Let me caveat this statement by saying that I've not delved into the source code to establish whether GELI adds its own salt but since the man page isn't explicit and there is no drawback we'll go for it. We're now ready to create our ZFS pool inside our GELI container. We're not going to write files to the ZFS dataset with the same name as the pool, since unlike other datasets you can't destroy it later. Instead we're going to create a structure amenable to using boot environments, though noting that our configuration isn't compatible with the boot environment management tools and so all dataset manipulation will have to be done by hand. As performance tweaks, we're going to disable recording of access time to files when they are read and also enable compression. Compression and decompression are fast, while GELI encryption and decryption and reading from disk are slow. Using compression means less data to encrypt, less to decrypt and less to read and write from disk. It will improve performance but feel free to run some benchmarks to satisfy yourself. We need to put all our filesystems in the appropriate place under /mnt for bsdinstall(1) to do its thing. Our zroot pool is already there. Choose the root password, configure your network interfaces, your timezone, services to be started at boot, add any users and exit to reach the "Manual Configuration" screen. Don't reboot yet but choose Yes to open a shell as we need to make some configuration changes. exit back to the installer, select Reboot. Remove the memory stick and keep your fingers crossed! If it doesn't work first time, don't despair! Boot to the install media, choose LiveCD and log in as root with a blank password. Mount the UFS filesystem and check over the configuration. You might be typing the wrong passphrase, but more likely you made a small mistake when typing the GELI key configuration in /boot/loader.conf. Check the path to the key file and that the keyfile exists. Congratulations, excellent howto. Thank you! Brilliant! Just worked for me on a new (to me) Lenovo ThinkPad 420s. If any links in that chain are broken, the EFI loader will panic. So if you skipped the step in this guide on creating a geli key, you may also have missed the creation of the boot directory nested inside the UFS boot partition. The EFI loader will not find the boot files if they're stored in the top level of the partition---hence the need for the symlink to /boot mentioned in the guide. Just thought I'd explicitly state that for posterity. ANOKNUSA: I'm pleased you found the HOWTO useful even though you are not using GELI. Regarding the need for a /boot directory, the way I think about it is that the boot loaders are written for a standard system, where the kernel and related files are in the /boot directory on the root partition. Even if the kernel and other boot files are moved elsewhere (as in this HOWTO), the boot loaders still expect that directory structure. A very nice how-to. Thank you. Just FYI, don't use AES-CBC. AES-XTS is much more secure and is the default in geli(8). In this configuration, I'm aiming to prevent someone reading my data if I lose the computer (all too common for laptops) or if it is stolen by a thief more interested in selling the hardware for cash than for any secrets on the hard disk. I am not looking to protect my data from espionage level attacks or from covert modification. One of my favorite cartoons and surely how it would play out in the real world. Why this scheme is incompatible with beadm ? Because it uses TWO ZFS pools, one for boot pool and one for root pool. abishai, vermaden: The configuration here actually boots from a UFS partition (where the kernel and other files in /boot are located), not a ZFS pool at all. For FreeBSD 10.1, the first stage UEFI boot loader only supports booting from a UFS partition. Not the reason. I looked into beadm quite ago, AFAIK it just replicates zroot/ROOT subsets. If something outside the scope, it is just left alone. So, according the guide only kernel is outside of the zroot scope (but, maybe one can solve the issue with symlink). beadm should work. Ah, I see. So, if I'm right, only a manually edit of vfs.root.mountfrom hint is needed? But that's not so bad, 90% of beadm will work. Create a snapshot of the current zroot/ROOT/master dataset, with a name representing the current system state (e.g. 10.3-RELEASE-p5). Perform your upgrade, dangerous system tweak, whatever. If something goes wrong, change to the new boot environment by setting the bootfs property of the pool to the clone (e.g. # zpool set bootfs=zroot/ROOT/10.3-RELEASE-p5). Since this can be done manually, you can use boot environments with any dataset arrangement you want. But beadm is pretty sweet, and it's also sweet that the UEFI loader and menu support it now. I have to admit I use it myself. No ZFS pools located, Can't boot. Hi harika1258. I've been intending to write an updated version of this post for some time since as of FreeBSD 10.3 the UEFI bootloader supports booting from a ZFS pool, not just a UFS partition. Hooray! Also a cause for celebration is the fact that the installer now includes the option to install to a ZFS pool in a GELI container so (as long as you're happy with the default encryption options; last I looked it used 256-bit AES-XTS which is fine if likely to be overly cautious for most users) it's possible to have an encrypted ZFS root without any of the manual and complex effort described in this HOWTO. I see you have made a number of ZFS and GELI related posts since this one. If you're still looking for assistance perhaps you could send me a message to say which thread is still active and I'll do my best to help.